Last year, I shared some libertarian humor relating to Valentine’s Day. This year, we’re going to be a bit more on the wonky side. Using roses as an example, we’re going to explore how the invisible hand of the market produces amazing results. Here’s a great new video from Marginal Revolution University. Narrated by Professor Alex Tabarrok of George Mason University’s economics department, it explains how consumers have amazing access to millions of roses even though (actually because) there’s no agency or department in charge of Valentine’s Day. And here’s a related video from MRU elaborating on the role of the price system. The moral of the story in these videos is that a free and unfettered market is far and away the best method of allocating resources. And the flip side of that lesson is that you get very bad results when politicians replace the invisible hand of the market with the visible foot of government. Here’s some of what I wrote, for instance, when discussing proposals to give politicians power over wage levels. And here are some excerpts from a post about the damaging impact of subsidies to higher education. Interfering with the price system is an especially pernicious form of intervention. When functioning properly, prices enable the wants and needs of consumers to be properly channeled to producers and suppliers in a way that promotes prosperity and efficiency. Unfortunately, governments hinder this system with all sorts of misguided policies such as subsidies and price controls. One of the worst manifestations of this type of intervention is the system of third-party payer, which occurs when government policies artificially reduce the perceived prices of goods and services. And I could cite lots of other examples on issues such as the minimum wage, health care, housing, and agriculture. Simply stated, you get all sorts of perverse results when politicians interfere with prices. And that means lower living standards over time as the economy operates less efficiently. Especially if a government really goes overboard and tries to regulate and control the entire economy rather than “just” interfere with a few sectors. Let’s look at the case of Venezuela. I’ve already written about how first Chavez and now Maduro have turned that nation into an economic hellhole. It’s so bad that even the establishment media are taking notice. Here are some passages from Matt O’Brien’s Wonkblog column in the Washington Post. Venezuela…has the largest oil reserves in the world. It should be rich. But it isn’t, and it’s getting even poorer now, because of economic mismanagement on a world-historical scale. The problem is simple: Venezuela’s government thinks it can have an economy by just pretending it does. That it can print as much money as it wants without stoking inflation by just saying it won’t. And that it can end shortages just by kicking people out of line. It’s a triumph of magical thinking that’s not much of one when it turns grocery-shopping into a days-long ordeal that may or may not actually turn up things like food or toilet paper. The government is trying to paper over its incompetence by printing money. …the Bolivarian regime is to blame. The trouble is that while it has tried to help the poor, which is commendable, it has also spent much more than it can afford, which is not. Indeed, Venezuela’s government is running a 14 percent of gross domestic product deficit right now, a fiscal hole so big that there’s only one way to fill it: the printing press. But…paying people with newly printed money only makes that money lose value, and prices go parabolic. It’s no wonder then that Venezuela’s inflation rate is officially 64 percent, is really something like 179 percent, and could get up to 1,000 percent, according to Bank of America, if Venezuela doesn’t change its byzantine currency controls. Venezuela’s government, in other words, is playing whac-a-mole with economic reality. And there’s also a pervasive system of price controls. Venezuela’s government wants to wish away the inflation it’s created, so it tells stores what prices they’re allowed to sell at. These bureaucrat-approved prices, however, are too low to be profitable, which is why the government has to give companies subsidies to make them worthwhile. Now when these price controls work, the result is shortages, and when they don’t, it’s even worse ones. …it’s not profitable for the unsubsidized companies to stock their shelves, and not profitable enough for the subsidized ones to do so, either. In the ultimate triumph of big government, Venezuela is even imposing controls on rationing! …shortages, which had already hit 30 percent of all goods before the central bank stopped keeping track last year, have gone from being a fact of life to the fact of life. …People have lined up for days to try to buy whatever they can, which isn’t much, from grocery stores that are even more empty than usual. The government has been forced to send the military in to these supermarkets to maintain some semblance of order, before it came up with an innovative new strategy for shortening the lines: kicking people out of them. Now they’re rationing spots in line, based on the last digit of people’s national ID cards. But you won’t be surprised to learn that all the problems are the fault of the private sector. It’s a man-made tragedy, and the men who made it won’t fix it. Maduro, for his part, blames the shortages on the “parasitic” private sector. It goes without saying, of course, that Maduro and the rest of the political elite avoid the consequences of bad economic policy. They all enjoy luxurious lifestyles, financed at the expense of ordinary Venezuelans. Moreover, I’m sure that Maduro and his cronies all have big bank accounts in New York or London. So I can understand why they like the current system. I’m genuinely mystified, though, why there are still people who think statism is better than capitalism. I guess it’s mostly naiveté, a triumph of good intentions over real-world results. 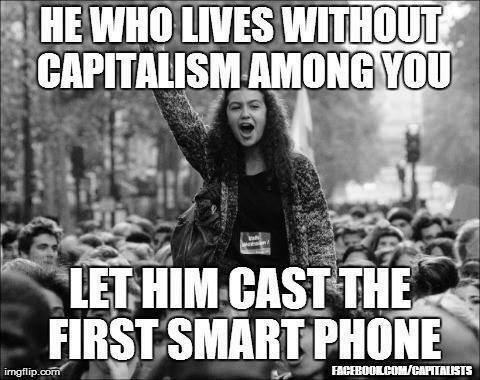 Even though most of these leftists presumably would go crazy if they had to live without the products made possible by capitalism. Just as portrayed in this video. And this satirical image. Those of us who reside in the real world, by contrast, already understand the difference between capitalism and statism. P.S. Venezuela is an economic basket case, but that apparently means it ranks higher than the United States on the “happy planet index” put together by some clueless statists. Having traveled to many of the world’s hellholes, Venezuela is the only place where I almost lost my life. That being to a pair of taxi drivers who “sold” me a trip to my hotel for a ransom. All of the engineering friends who I knew in Venezuela have since fled to the safety of other countries. Many are in Canada-Imagine how they must love the winters there. Shortly after Chavez ousted Luis Giusti in favor of an army colonel, these engineers made the mistake of signing a petition asking Chavez to give them a leader who understood the oil and gas industry. Their names on the petition gave the army a shopping list of people to go after. Like South African flight from tyranny, a country cannot survive when its best and brightest are not available to solve its problems. I must admit that the corruption in Venezuela preceded Chavez, or he would have never been elected in the first place. Mexico will be next to follow this path. They are very close now, and suffer from some of the greatest corruption and class disparity on the planet. Venezuela has evened the table on this matter- all the working people are now poor.